Really? 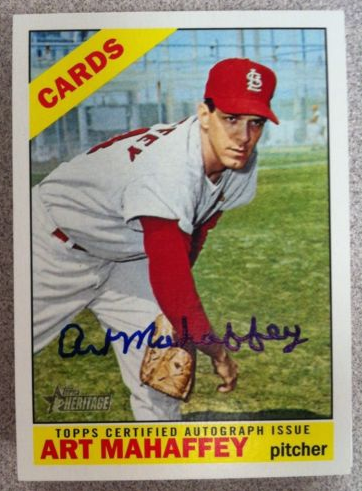 You really waited until now to issue an Art Mahaffey autograph card, and you did so depicting him as a Cardinal. I have no interest in this Art Mahaffey autograph card. You couldn’t have created one for any of the last five Heritage sets, where it would’ve made far more sense to issue one that depicted him as a Phillie… wearing the uniform of the team that he was a two-time All-Star with. No, instead you waited until you had to issue one of him as a Cardinal — the team he ignominiously ended his career with. I much would’ve rather had a Mahaffey autograph as a Phillie than the Roger Craig one that you did issue in this year’s Heritage. You really don’t seem to get it, Topps.